Super Paper Mario Description Strikes enemies with lightning. A Thunder Rage is an item in the Paper Mario series first appearing in Paper Mario. It deals five lightning-elemental damage to all enemies on-screen, and acts like a stronger version of Thunder Bolt, an item that hurts only one enemy. The Thunder Rage appears to be upside down, as opposed to its upright position in later Paper Mario games. It can be created by giving Tayce T. a Dried Fruit and a Volt Shroom. It reappears in Paper Mario: The Thousand-Year Door. The description claims that this item has a small chance of stunning an enemy, but this is incorrect. However, it can give enemies the POW-Down status if the latter was hacked. It can also be cooked by mixing a Shooting Star with a Point Swap. However, if used on lightning related enemies such as Ruff Puffs, they will gain HP. 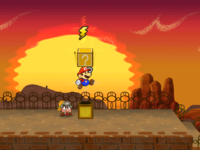 When used in Super Paper Mario, the player must first shake the Wii Remote to gain power. After that, lightning will strike on-screen enemies, dealing from a minimum of 3 damage to a maximum of 12 damage to them depending on how much the Wii Remote has been shaked. It can be cooked to make an Electro Pop. In volume 26 of Super Mario-Kun, a Yoshi in the Fearsome 5 uses a Thunder Rage to defeat a White Magikoopa. In a hidden ? Block two screens north of the entrance screen of Dry Dry Desert. In a hidden ? Block near the railroad switch in the pink area of Shy Guy's Toy Box. In a hidden ? Block near the north exit of the southwesternmost screen of Jade Jungle. In a hidden ? Block near the east exit of the second screen on the northeastern road of Flower Fields. In the third stone cavern on Shiver Mountain. On a platform in the lava area of Bowser's Castle. Dropped by Tiger Li'l Oinks, Lakitus, Ruff Puffs and Spy Guys. Also has a chance to appear when using a Mystery. The hidden block in Riverside Station. In the lower right corner of the bubble pond area in The Great Tree. In the ? Block on top of the high mountain on Keelhaul Key. In a hidden ? Block in the sunset area behind Riverside Station. In the high ? Block in the first descended area of the corridor between the Riddle Tower to Shadow Queen's room. On sale at the Twilight Shop for 20 coins, the Sales Stall for 15 coins, and Charlieton's shop in the Pit of 100 Trials for 40 to 200 coins. Dropped by Koopatrols, Hammer Bros, Lakitus, Dark Lakitus, Spunias, Ruff Puffs, Poison Puffs, Dark Boos, Wizzerds, Dark Wizzerds, Elite X-Nauts, as well as the Glitzville Spinies, Hammer Bros, and Red Magikoopas. This page was last edited on November 26, 2018, at 18:39.